Ashok Atluri is a graduate in Commerce from Osmania University and a PG Diploma holder in Applied Computer Science from CMC. He is a first generation Entrepreneur who along with his partners stared Zen Technologies, which was one of the a pioneers in the field of Simulation in India. He was instrumental in helping to design the simulators so that they would be simple to use, and ensured that the products would be based on industry standards, by developing the software on the Windows-Intel platforms. He is also a recipient of the "Small Scale Entrepreneur of the Year" award from Hyderabad Management Association in 1998. He is a member of Young President's Organization (YPO) since 2006 and was the education chair for the YPO, Hyd Chapter from 2012-13 the Chapter Chair for 2013-14. 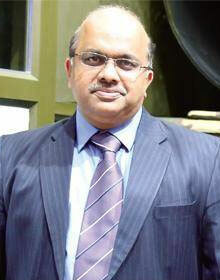 He has done Leadership program in IIM, Calcutta and was the organizer of YPO-ISB Leadership program at Hyderabad. He was also a part of the YPO Leadership programs at Harvard Business School, London Business School and at Stanford.